Research demonstrates that the prevalence of mental health conditions among justice system involved youth is alarmingly high, coupled with a strong likelihood of multiple traumatic exposures. Unfortunately, while the need for appropriate and timely treatment is acute, the juvenile justice system seems challenged in meeting it. The authors of this issue of Focal Point identify and propose solutions to these challenges with new research findings. 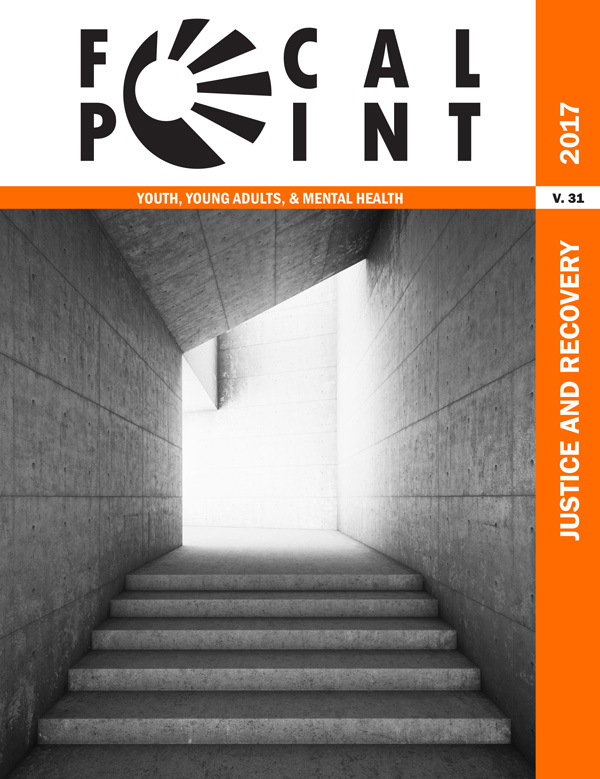 This introduction from Focal Point editor John Ossowski discusses how this issue addresses the current state of juvenile justice and where research indicates the future is headed. The author recounts her son’s experience within a juvenile justice system that exacerbated his mental health conditions. This article examines the confluence of mental health needs and racial disparities within the juvenile justice system. A young adult provides a critique of the juvenile system in which he was incarcerated, noting its emphasis on treating mental health conditions with medication rather than therapy. This article recommends specific improvements to certain policies of the juvenile justice system pertaining to youth with mental health conditions in order to promote more positive outcomes. This article discusses how juvenile justice practitioners can use the Risk-Needs-Responsivity (R-N-R) intervention framework to promote rehabilitation among justice-involved youth. What Organizational Factors Influence Mental Health Treatment Allocation? This article breaks down key factors that determine whether and how juvenile detention centers prioritize mental health treatment for youth. This article describes an Ohio program that provides alternatives to detention for youth who have mental health needs or substance abuse issues. Reclaiming Futures is a peer-based, professionally-coached national learning collaborative aimed at juvenile justice reform. This article outlines evidence of the Reclaiming Futures model’s impact. The interviewees describe an evidence-based practice to reduce justice system involvement among emerging adults via a youth-specific modification to the extant Multi-Systemic Therapy (MST) intervention. This article details findings from a study of the effects of various factors on recidivism and employment and educational outcomes among serious adolescent offenders.